MINNEAPOLIS -- Lunchtime is an important time of day for convenience stores; however, there is stiff competition from a variety of competing venues, including fast-food stores, coffee shops and more. 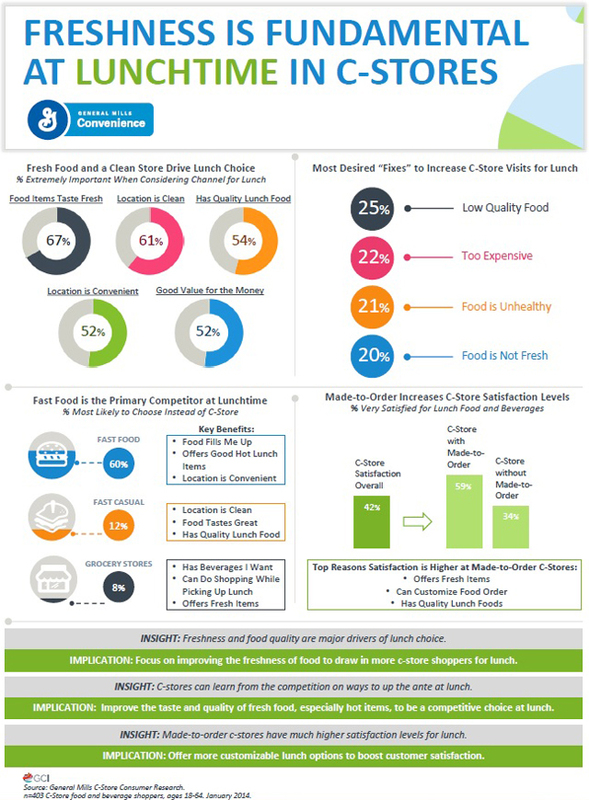 Key considerations at lunch include fresh food, high-quality food and a clean store environment, said General Mills Convenience & Foodservice, which recently conducted a research project to understand the convenience channel's strengths and opportunities at lunchtime. Made-to-order convenience stores have strong satisfaction levels among shoppers because they can customize their orders, reinforcing that the food is made fresh. 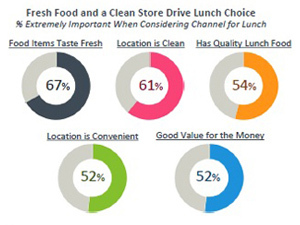 59% of shoppers who eat at store with made-to-order food are "very satisfied." *4% of shoppers who eat at stores without made-to-order food are "very satisfied." Satisfaction levels for convenience stores with made-to-order items exceed those of fast food restaurants (47% of shoppers are "very satisfied" with fast-food lunch). Fast-food restaurants are the biggest threat for lunchtime business; 60% of shoppers indicate fast food as the top alternative to convenience stores for lunch on the go. Convenience, tasty hot lunch items and filling portions are the three top reasons for choosing fast food. "Quality food is critical for success at lunchtime, and quality is all about freshness. In fact, the desire for freshness is a pattern we see in the morning as well. Stores looking to grow their lunch business need to focus on and communicate the freshness and quality of their offerings," said Chris Quam, consumer insights manager at General Mills Convenience & Foodservice. "Making items in-store is the best way to do that. And messaging such as 'made fresh daily' can also go a long way. Additionally, convenience stores have a weapon that fast food does not: a broad range of cold beverages and salty snacks. Cross-promoting these categories with fresh lunch items is a key way to build lunchtime baskets." A group of 403 convenience store food and beverage shoppers, ages 18 to 64, participated in a nationwide online survey in Jan. 2014. All participants said they regularly buy lunch on the go from venues such as fast-food, fast-casual restaurants, coffee shops and convenience stores. The General Mills Convenience & Foodservice division serves the convenience, foodservice and bakery industries by providing quality products from time-trusted brands along with culinary, nutrition education and marketing resources to help operators succeed. Its brand portfolio includes Big G Cereals, Yoplait, Nature Valley, Gold Medal, Pillsbury, Chex Mix, Bugles, and Gardetto's. Based in Minneapolis, the division generates $2 billion in annual sales.